When traveling to Italy keep in mind that "La Cucina Italiana" is actually an array of regional, provincial, local and family dishes that vary from season to season and cook to cook. It is a deliciously random fund of little treasures, of recipes rarely written down but passed intuitively from one generation to another, modified according to the produce available and enhanced by knowing hands. Still, there is no denying that some cooks have attempted to standardize the fare. You can find spaghetti alla carbonara on menus in Milan and costoletta alla milanese in Rome, peperonata in Verona and polenta in Palermo. 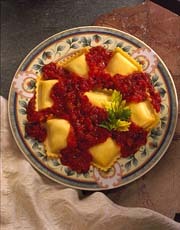 All healthy citizens regularly eat pasta in some form or other and nearly every village north and south has a pizzeria. But the variations from place to place are infinite, and as any experienced gastronome will insist, you have to travel to the place of origin to taste the foods and wines of Italy together at their authentic best. The eight regions of northern Italy (Val D'Aosta, Piemonte, Liguria, Lombardia, Veneto, Trentino Alto-Adige, Friuli-Venezia Giulia and Emilia-Romagna) boast the nation's highest standard of living and in turn the most extravagant dishes. The plains along the Po and lesser rivers from Piemonte to the northern rim of the Adriatic are filled with grain, corn, rice, fruit, livestock and dairy products. Vineyards on slopes along the great arc formed by the Alps and Apennines are Italy's prime sources of premium wine. Most people outside of Italy make the mistake of grouping the "northern Italian cuisine." Menus often mix Bologna's tagliatelle with Genoa's trenette noodles and pesto, Milan's risotto and veal shanks, Venice's soft shell crabs, Trieste's goulash and sauerkraut. Even today, despite standardization of tastes and the invasion of fast food, no other area of Italy maintains such diversity in regional cooking. The truth is much of the cuisine in the north of Italy is a mixture of the surrounding cultures. For example: French influences remain in recipes of Piemonte, Liguria, Lombardy and Emilia to the northwest, just as Austro-Hungarian tangs linger in foods of Veneto, Friuli-Venezia Giulia and Trentino-Alto Adige. But local tastes rule in this vast territory where culinary customs vary delectably from province to province and town to town. Still, some generalizations might be made about northern cooking. Perhaps the most popular category of primi are soups, which may include pasta, rice, polenta, gnocchi, bread, vegetables, beans, meats or seafood. Prominent examples of northern minestre are the noodle and bean pasta e fagioli of the Veneto and Friuli, the fish chowders of Liguri and the Adriatic coast, Milan's tripe-based busecca and Emilia-Romagna's delicate pasta in brodo "broth". A meat dish eaten nearly everywhere in the north is bollito misto. But the mix varies between beef, veal, pork sausages and poultry, while sauces range from parsley-based salsa verde to Piemonte's tomato red bagnet ross, fritto misto is also eaten in most regions, though compositions of fried meats, cheeses, vegetables, fruits and pastries are never the same from one place to another. Pork plays a prime role in salt-cured meats like Prosciutto from Parma and San Daniele, the salt-cured ham described as dolce due to the ripe flavor and soft texture that develop over a year or more of maturing. The delights of salumi range beyond pork to beef for the bresaola of Lombardy's Valtellina, as well as goat, goose and chamois for salame and sausages. Northern Italy is a paradise for cheese lovers.They may begin with Parmigiano Reggiano and Grana Padano, which account for a major share of national production, and nibble their way through blue-veined Gorgonzola, buttery Fontina, tangy Asiago and a vast array of mild, creamy, ripe and sharp cheeses, mainly from cows but also from sheep and goats. Central Italy has historically been known for simplicity and balance. The diet in all five regions relys on olive oil, grains and seasonal produce but cooking styles vary in a territory split into ethnical enclaves by the Apennines, the mountainous spine of Italy. Rome serves as an intermediary between north and south in political as well as culinary matters. Abruzzi and Molise show a southern touch in dishes, the Marches share recipes with central neighbors, as well as Emilia-Romagna to the north. Tuscany and Umbria have tastes in common, though throughout the heartland cooks uphold traditions in local ways. The ancient grain called farro, the predecessor of hard wheat, is still used in soups. Until recent times, the chestnut was the leading staple of the diet in the uplands of the Apennines. Eaten roasted or boiled, chestnuts were also dried and ground into flour for polenta, soups, flat breads, cakes and pastries. They were even used to fatten pigs. Today, of course, wheat is the base of pasta and most bread, including the unsalted loaves unique to Tuscany, Umbria and the Marches. Overall the use of pasta is about evenly split between dried and fresh types in the central regions, where rice and polenta play secondary roles. 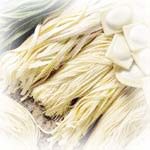 Abruzzi and Molise have solid traditions of pasta. In Lazio, spaghetti, bucatini and rigatoni share the spotlight with Rome's egg-based fettuccine. Dried pasta is produced in quantity in Umbria and the Marches, though cooks still often hand roll the dough for tagliatelle and local delights. Homemade noodles are also preferred in Tuscany, but that's one place where bread historically outweighed pasta. Fine olive oil is made through the central hills, though the paragon of extra virgin comes from Tuscany, Umbria, northern Lazio and Abruzzi. Garden produce is rigorously seasonal. Rome is renowned for artichokes and peas, Tuscany for white beans and black cabbage, the uplands of Abruzzi, Umbria and the Marches for lentils, chickpeas and potatoes. The central Apennines are a major source of truffles, both the prized white varieties found in the Marches and parts of Tuscany and the black varieties that thrive in Umbria. 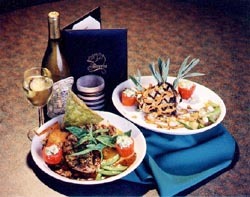 Consumption of fresh seafood was historically confined to coastal areas. Each Adriatic port boasts a local recipe for the fish soup called brodetto. But even in inland places, such as landlocked Umbria, cooks made good use of preserved anchovies, tuna, sardines and salt cod. Meat plays a key role in regional diets, with preferences for lamb to the south and veal and beef to the north, particularly in Tuscany. Poultry and rabbits are appreciated everywhere, as are game birds, hare and wild boar in regions where hunting is still considered more a birthright than a sport. Pork is prominent everywhere, in the salumi made by butchers whose ancient craft was perfected in the Umbrian town of Norcia. The Marches, Lazio, Umbria and Tuscany all claim the origins of porchetta, a whole pig boned and stuffed with garlic, wild fennel, rock salt and peppercorns and roasted slowly in wood-burning ovens. Pecorino is the dominant cheese in all regions, though styles range from soft to firm and tangy types to aged Pecorino Romano, hard and sharp and used mainly for grating. 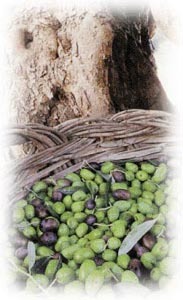 Foods in Southern Italy are made from basic elements, olive oil, wine, cheese, grains, fruits and vegetables. The most celebrated foods and wines of the ancient world were produced in these sunny lands at the heart of the Mediterranean. Yet it isn't historically correct to group collectively seven regions that boast distinct cultural heritages. Two are the Mediterranean's largest islands, Sicily and Sardinia, whose natural isolation explains their culunary individuality, but Calabria, Basilicata, Molise, Puglia and Campania that are side by side also follow certain customs. Southerners shared bonds of unity, if invariably imposed, under Byzantines and Normans and on and off for centuries under French and Spanish rulers of what came to be called the Kingdom of the Two Sicilies. Sardinia, however, often went its own way, and even today people of the seven regions retain their autonomous spirits. Yet all eventually surrendered to local tastes, won over by the flavors, aromas and colors of things that grow in the fruitful earth. Olive oil is fundamental, but the symbol of southern cooking, curiously enough, came to be the tomato, which arrived with peppers, beans and potatoes from America. The "pomodoro" found a promised land alongside the eggplant from Asia, the "melanzane" that distinguishes the"parmigiana" classics of Campania and many other dishes. The irresistible simplicity of southern food comes from herbs and spices, above all the tangs of garlic and chili peppers. Italy's first pasta was almost certainly made in the south, though noodles were preceded by flatbreads called focacce, the forerunners of pizza, whose spiritual home (if not its place of origin) is Naples. Baked goods, including pastries, biscuits and cakes, abound on the islands though nowhere as evidently as in Sardinia, where each village has its own styles of bread. Arabs in Sicily established a pasta industry in the Middle Ages, using durum wheat for the dried types that still prevail in the south. Tubes and other forms of "short" pasta may be referred to generically as maccheroni , distinguished from "long" types such as spaghetti and vermicelli. Also popular are spiral-shaped fusilli, oblique tubes called penne and larger tubes called ziti , though variations make the pasta field as confusing as it is intriguing. Fresh pasta is also prized, sometimes made with eggs but more often not, in such familiar forms as lasagne, fettuccine and ravioli, through there is no shortage of local peculiarities. Southern geography is marked by often sharp contrasts between rambling seacoasts and masses of mountains and hills that dominate the interior of most regions. Coastal dwellers have habitually eaten seafood and hill people meat, though preferences aren't always clear cut. Deep waters of the Tyrrhenian and Ionian seas render tuna and swordfish, shallower waters mollusks and crustaceans for the delectably fresh "frutti di mare". Anchovies and sardines are fixtures through the south, though it's also curious to note that all regions have recipes for baccalà or stoccafisso, the dried cod apparently introduced by the Normans. Historically, meat had been used sparingly in the south, where every part of the animal is still rendered edible. Prime cuts of veal and beef are rare and prized. Lamb is the glory of the hill country, grilled, roasted, braised or stewed in ragouts to be served with pasta. Poultry is popular, as are game birds, boar and hare where available. But the perennial provider has been the pig, preserved in all manner of sausages and salame (often spicy), soppressata, hams, salt pork and lard that in some places substitutes for olive oil in cooking. Cheese is fundamental in southern diets. Sheep provide pecorino, which may be eaten at early stages of ripeness or aged to be used for grating. Goat's milk is the source of Caprino. Ricotta, preferably from sheep, is eaten fresh or used in pasta fillings, pastries and desserts, though it is also salted and dried to be sliced or grated. The most prominent family of southern cheeses are the pasta filata types, which come mainly from cows. The exemplar is mozzarella, originally (and best) from the milk of bufala,"bufalo", but popular as the cow's milk fior di latte. The oldest member of the clan is caciocavallo, whose name refers to dual forms hanging from strings like saddle bags astride a horse (cavallo). Like the similar provolone, caciocavallo may be eaten after a few months as dolce (mild and tender) or aged for a year or more as piccante (sharp and hard and suited for grating). Both may be smoked. In between are the spongy provola and scamorza, both eaten young, often cooked or smoked. Burrino or butirro is a special pasta filata type with a core of butter. No other sector of Italy boasts such a splendid heritage of sweets and ices. Many desserts bespeak the Arab and Greek influences in Sicily, with its almond pastes, candied fruits, ricotta, honey, raisins and nuts. Anyone with a sweet tooth will find delights all over the south.